In the 19 years since it was founded, the Dallas-born fashion boutique Forty Five Ten has continued to establish itself as one of the world’s most exciting retail destinations with its pioneering fusion of art and fashion. 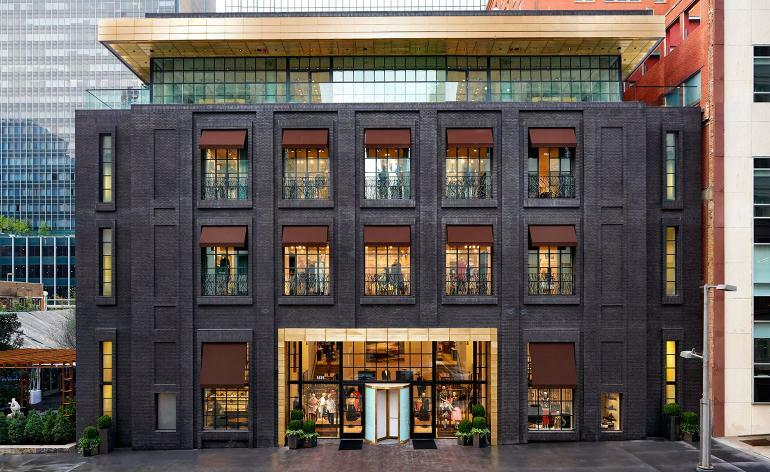 This month, the boutique, which also boasts well-heeled outposts in Aspen, Miami and Napa, opens a stylish new set of doors within New York’s Hudson Yards. Situated on the fifth floor of the Shops at Hudson Yards, conveniently nestled between Momofuku’s Kawi and Bouchon Bakery, the sprawling, 16,000 sq ft space has been designed in collaboration with Snarkitecture. To that end, the husband and wife team worked with Snarkitecture to develop the boutique’s eye-catching glass brick storefront, which wittily riffs on the traditional exposed brick convention. Snarkitecture also designed the grid-shaped retail displays that loosely evoke the 1960s ethos of Superstudio. Forty Five Ten’s New York boutique is comprised of four individual stores that have been divided into women’s designer, men’s store, collected vintage and 4510/Six, a platform for emerging fashion and home design. Throughout its offering, plenty of treasures abound, ranging from memorable artworks and sculptures from artists such as Lars Fisk, Jose Dávila and Al Freeman to special collaborations like a limited edition fashion capsule with the Brooklyn-based artist Katie Stout. Throw into that Forty Five Ten’s signature traits, such as bright pastel colours, bold flourishes like mirrored panels and eclectic terrazzo flooring in the case of the New York store, and a curated selection of specially selected art and its mix of directional, high fashion, the spacious boutique has all the trappings of fashion mecca that you’ll find hard to leave.